Explore Science Beyond the Classroom: Help Them Get Out of Town! Help Them Get Out of Town! I have been working hard to fatten up my little friends all summer long. They came in spring, reared their young, and now its time to take off. I'm talking about the Ruby-throated Hummingbirds. The males arrived first and scouted out our home and farm. Then the females arrived. They built nests.They ate lots of insects. And when it was time to make the long journey back to Central America they came to my feeders and engorged themselves on sweet water. I saw them grow and get fat and now they are leaving, but not for good. They will be back sooner than you think so please help them out and make lots of these feeders for their spring arrival. Hummingbirds like to fight (just like children) so make more than one and separate them by at least 15 feet. 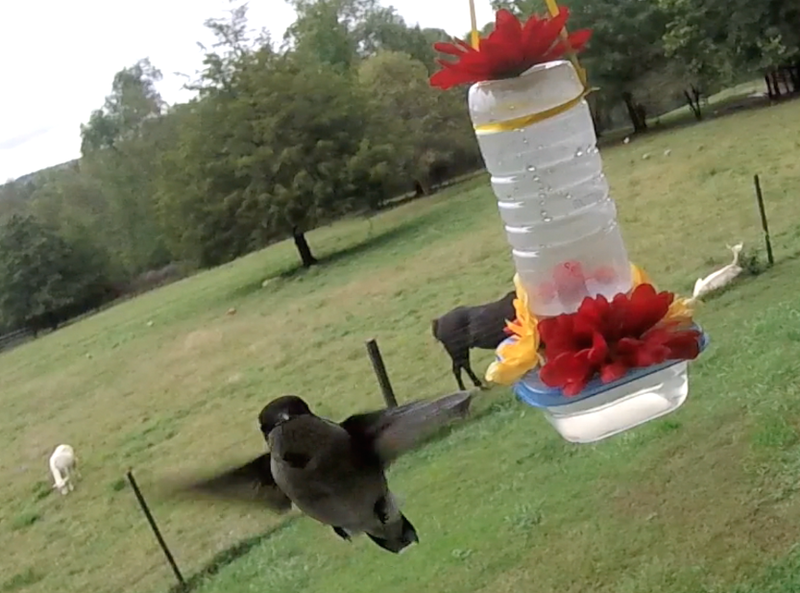 As most of you know, I have been working on an online Hummingbird Lab. In one of these lessons, I teach the students how to make their own hummingbird feeder from materials you can find at home or at discount stores. I still had plenty of birds at my feeder a few days ago but they will be heading south soon so this is a great project to make in the spring when they start heading back up north.